Good for Lucas - you can apprentice him to your brother, his uncle. Lucas certainly has an eye for a photo. He's done well. That's a great shot and perfect for monochrome. It makes for an excellent shot! Well done, Lucas! The composition of his photo is really quite excellent. I think you have a budding photographer! Great shot perfect for monochrome. 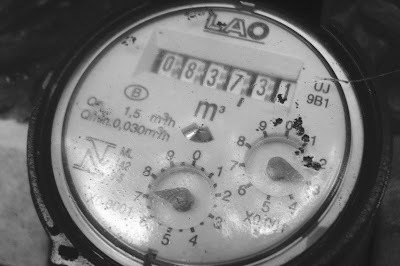 I like that photo of the old water meter! It would look realy nice as part of an altered art card, too! Glad you had a good time with your family!